This week, Sheldon could not figure out Howard’s card trick using math. But that was fiction. Playing cards and mathematics go hand in hand. In real life, Sheldon’s analysis may well have worked. How many ways are there to shuffle a deck of cards? This question is a classic example of a branch of mathematics called combinatorics. The first card can be any, or 1 of 52 possibilities. The second card is more constrained because one card has already been chosen. So it has 1 of 51 possibilities. Now suppose you are asking what is the number of ways the first card is what it is AND that the second card is what it is. 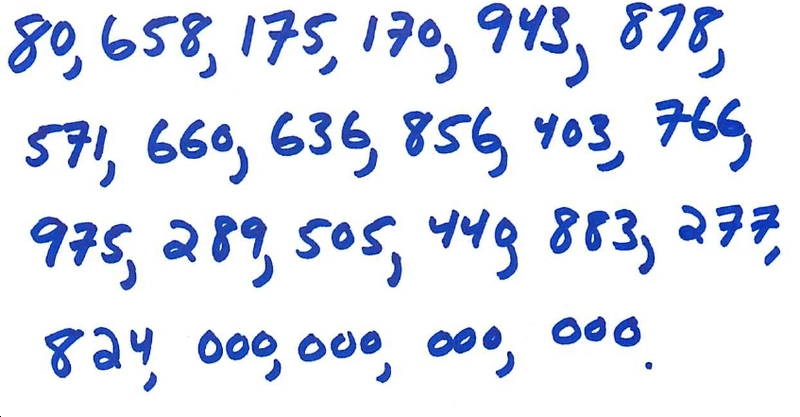 In this case AND means multiply the possibilities, so there are 52*51=2,652 different ways to shuffle the first two cards. The number on Sheldon’s board. The number of ways to shuffle a deck of playing cards. More compactly, this is 8*1067. Or in plain English, the number is “80 unvigintillion”. The British have a different word for it, “80 undecillion” but they don’t even get “a billion” right. The Brits traditionally call a “trillion” a “billion” because they skip over “billion” as a “thousand million”. Since they don’t call a million a “thousand thousand”, consistency is apparently not their strong suit. In any language it is still a large number. Even if every one of the 7 billion men, women, and children on Earth played one billion card games every year for a billion years, they would not even make a dent in the number of possible shuffled decks of cards. We may well ask a different question. Has there likely ever been two games played from the same shuffled deck? That is a different exercise in combinatorics. The chance is much higher. The answer is not just the number of games ever played divided by that big number. An example of this effect is the classic question: “What is the chance that in a room of 23 people, two have the same birthday?” You might naively guess 23/365 or 6%. But it turns out to be greater than a 50% chance. Among 57 people, there is a 99% chance that two have the same birthday. Since twins sometimes hang out together and other correlations may be found, the real chance is much higher, but we are assuming everyone’s birthday in the room is independent. If a 5o% chance seems surprisingly large for one pair among 23 people to have the same birthday, remember we haven’t chosen which day. We are not asking the chance they have your birthday or Britney’s birthday, but that any pair has the same birthday, no matter what day. Luckily, the same question can be asked a more illuminating, way: What is the probability that nobody in the group has the same birthday as each another? If there is 50% chance that none have the same birthday, then there is a 50% some pair does. That is a 49% chance no pair has the same birthday. And hence, 51% do. So back to our problem of what is the chance that no two card games have ever started with the same deck. I’ll start with assumption that every deck was well enough shuffled that they were all independent. Given the number of drunk poker players and the fact that every purchased new deck starts out the same, I know this is a poor assumption. Repeating the birthday calculation for decks of cards — using the big number above — is left for an exercise for the comments. 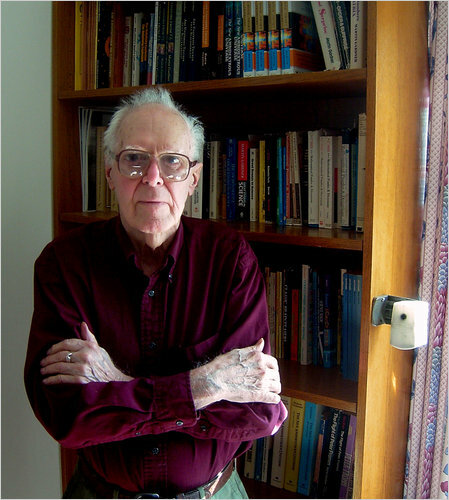 Martin Gardner wrote an article every month about “recreational mathematics” (Yes, there is such a thing) for the popular magazine Scientific American. Mathematics of card tricks was an expertise of Gardner, just as Sheldon was reckoning on the white boards. Many tricks were published in his 1956 book Mathematics, Magic and Mystery. Here’s one of Martin Gardner’s simpler card tricks based on mathematics that you can now use to amaze and entertain your friends for hours. Start with The Cyclic Number trick, which Gardner attributes to Mr. Lloyd Jones of Oakland California (1942). Give your spectator five red cards: 2, 3, 4, 5, and 6. Keep for yourself six black cards: A, 4, 2,8, 5, 7. The magician deals out his cards in a row and has his spectator write down the number: 142857. The player picks one of his cards, say 5, and multiplies the two on a sheet of paper giving in this case 714285. The magician picks up his cards, gives a quick cut and lo and behold, deals out the six cards in order corresponding to the spectator’s multiplication: 714285. The trick rests on the fact that the number 142857 is cyclic. Multiply it by any number and the result will be the same numbers, in the same order. What else would you expect the reciprocal of a prime number, in this case seven, to do? Math (and a little dexterity faking the cuts and shuffles) is all you need. Using the mathematical structure of a deck (4 suits, 13 types of cards) leads to a variety of more complex games, including modular arithmetic which was the reason for “mod 4” and “mod 13” on the boards. Pick up Gardner’s book and enjoy. Sorry this blog post is late because I never did figure out the math behind Howard’s trick.